Newly anointed billionaire arch-conservative Florida governor Rick Scott—along with his all-GOP cabinet and tea-party-led state legislature—will get around to the state’s budget crisis, its mortgage meltdown, its educational woes, its brain drain, its disaster-preparedness services, and its corruption problems eventually. But not until they’ve finished with their crap storm over, well, crap. Last spring, outgoing Gov. Charlie Crist signed a landmark bill into law requiring septic tanks to undergo once-every-five-year inspections—the first time in Florida history that such inspections would be instituted. In a state where more than half of its 2.6 million septic tanks are over 30 years old, and 10 percent are estimated to be failing—a state where the water table is usually just a couple of inches below your feet—this didn’t seem like such a bad idea. Not even to last session’s Republicans: The bill’s author was Lee Constantine, a GOP representative from Altamonte Springs. It was a “consensus bill on water policy which the agency involved, local government, environmentalists, business and industry support,” he said. …tea party groups and homeowners in North Florida, where much of the state’s 2.6 million septic tanks are located, have fought against the inspections as costly and unnecessary. The inspections would have included evaluations and pump-outs, with the costs borne by the owner. Septic tank owners who purchased their tank or had it serviced in the last five years would have been exempt from the inspections. 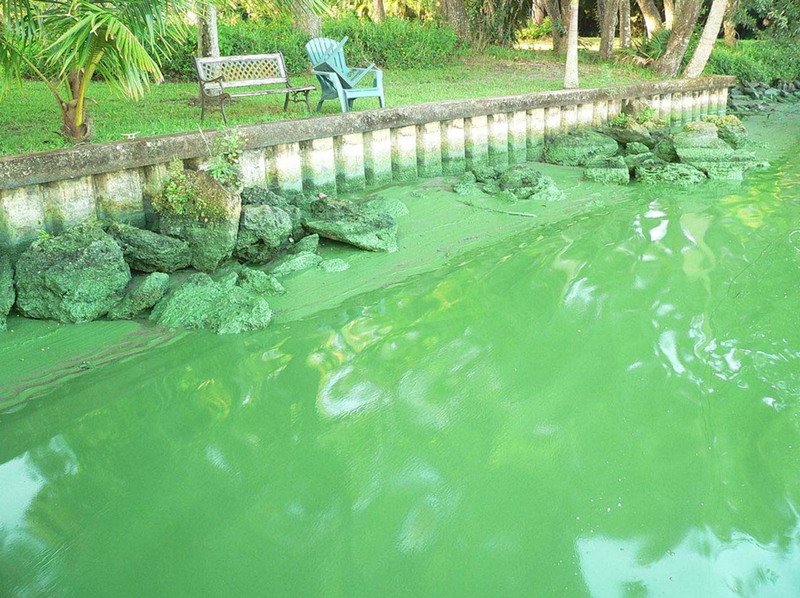 The (sludgy) greening: Florida’s polluted Caloosahatchee River. Courtesy of Sierra Club Florida. But it’s a small price to pay for protecting Florida taxpayers from the long arm of the gubmint, right? Actually, the inspections (originated by a Republican, remember?) would have been run by a private contractor, and the state Department of Health estimated the annual cost of inspection to be $122.40…including a pump-out. Too much for Scott and his freedom-loving cohort in the Capitol. “Governor Scott called me (Wednesday) to inform me that he would be allowing the legislation regarding the delay of implementation of septic tank regulations, passed during Special Session 2010A, to become law. I told him ‘thank you,’ and that the Legislature would be working on a permanent resolution to correct this overburdensome regulation that I voted against when it passed the first time,” said Rep. Brad Drake, R-Orlando, a leading combatant of government overreach in scatological affairs.